The most important difference between the lavta and the ud is the presence of frets like those of the tanbur on its neck. Originally made of gut tied onto the neck, the frets are today made of monofilament. As in the tanbur, the number of frets on present-day instruments has increased over that of their forbearers. The body of the lavta, as of the ud, is constructed of thin staves glued side-by-side. The face is made of reinforced spruce, with a single large sound hole. 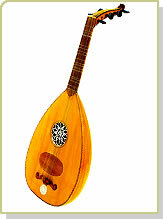 The lavta constitutes an intermediate between the ud and the tanbur both in terms of structure and of tone. Before the 19th century, the lavta, along with the kemençe and the tef (tambourine), comprised the kaba saz (vulgar instrument) ensemble that accompanied köçekçe dancers (male dancers who dressed as females). Here it provided a rhythmic accompaniment for the kemençe, which carried the melody. Towards the end of the 19th century however, it entered the ince saz (fine/delicate instrument) ensemble, composed of instruments like the tanbur, violin, ud, kanun and ney. Certain picking styles were developed according to the different usuls (rhythmic patterns). Becoming a sought-after instrument especially in the ensembles performing in nightclubs and cafes with live music, the lavta was played mostly by Greek musicians. One of our last great virtuosos on the lavta, Tanburî Cemil Bey (1873-1916) played a major role in its transformation from a mainly rhythmic instrument into a melodic instrument. Special picking patterns unique to the lavta, which were adopted by ud players as well, were forgotten after Yorgo Bacanos (1900-1977), who was the last representative of this tradition. During the mid 1980s, the lavta again began to be included in some radio and television programs.